First of all wash your face with lukewarm and any beauty soap to remove dust particles. For face washing lukewarm water is best because it open skin pores for deep skin cleansing. After face wash pat dry your skin with soft towel. Now dip a cotton ball in some lukewarm milk and cleanse your skin by using circular and upward strokes with gentle pressure. 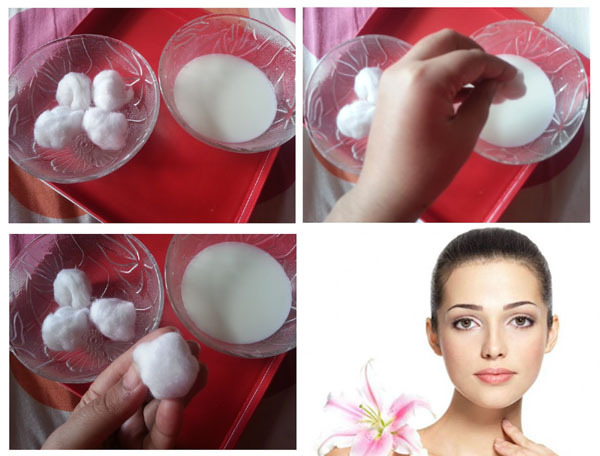 Massage your skin with this cotton ball for 3-5 minutes. Let the milk absorb in your skin at least for 5 minutes and then rinse your face with fresh water. Similarly your can cleanse your neck, elbows, hands and feet and get back your soft, supple and rejuvenated skin. (i)For skin cleansing goat's milk is best because it contains the higher amount of lactic acid. (ii)If you have Oily skin, use fat free or skim milk. (iii)Milk increases the sensitivity of skin for UV Sun rays. After skin cleansing don't forget to apply a good sunscreen to protect your skin from harmful effects of UV Sun rays. (iv)For best results cleanse your skin at least twice per week.